Here is an ATS optimized resume sample. Below the resume, you'll see an explanation describing why certain formatting choices were made. Administrative professional with seven years of experience in the nonprofit sector. Able to prioritize and manage conflicting demands. Exceptional technical skills including proficiency with Word, Excel, PowerPoint and Prezi; type 80 words per minute. Each piece of the contact information is on a single line and left justified. This format certainly doesn't look as attractive as a traditional resume written for human eyes, but it is simple and not likely to cause problems with the ATS. There is no unexpected information in this section. If this job seeker was applying to a job that was far from her home, she might consider omitting her mailing address to avoid being screened out based on location. First, notice that this heading (and all of the other headings) is typed in all capitals and bolded with a line break separating out each section. All of these cues help the ATS to understand we have reached a new section. Also, notice that all of the section headings are standard, and straightforward. It is important to avoid non-standard section heading on resumes written for ATS screening. The summary is written in bulleted point form, which makes it more readable for an ATS. This particular summary is fairly short, but it would be fine to include several more points in the list if adding those points helped show this person's full range of skills and experience and allowed her to add more relevant keywords to the resume. The work experience is straightforward, and in reverse chronological order. Notice the way the employment information is organized. It is important to write your dates of employment after the company name and after your job title, otherwise the ATS may misinterpret the information. Also, notice the words "incorporated" and "LLC" are included after the company name. 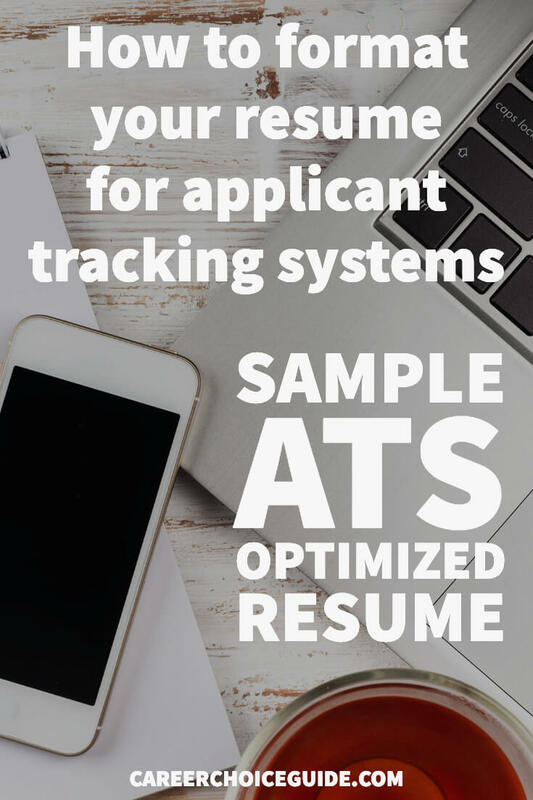 It is wise to use the full, formal company name on an ATS optimized resume because those "company words" help the software to understand that is the company name. Again, the organization of this section is important. Ensure the dates come last when you set up your education information. The job seeker has not included any detailed information about her education. If adding some information about her course work allowed her to add more relevant skills, she could included that information in bulleted point form. The recommendations for this section are the same as the previous two sections, ensure the dates are last, and look for opportunities to include relevant keywords in the description of your volunteer work. Please note that it is optional to include a section describing your volunteer work. Only add this information if it shows skills and experience that is relevant to the job you are seeking. My book, The Resume Writing Guide will give you step-by-step instructions for writing an effective resume optimized for human reviewers or ATS software.